Now that it’s the dead of winter here in the northern hemisphere, being stuck inside is starting to wear on us all. Imagine how much worse it is for students with ADHD! During the cold weather, it’s challenging to find productive ways to help children burn off their excess energy. We know exercise is crucial for students with ADHD, so finding active ways to get students’ bodies moving is essential. My sister has ADHD, and when we were kids my parents installed a punching bag in our basement to help her deal with being cooped up during inclement weather. Other great indoor activities include swimming, rock climbing, or even yoga. If you’re looking for more tips on how to help kids positively channel their winter energy, check out this ADDiture article. 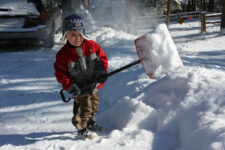 My favorite strategy is to give kids “heavy” winter chores, such as shoveling snow or ice. Physical chores like these do more than simply expend energy. By giving children tasks with a purpose, they will feel less like they are being “managed” by their parents and more proud of the job they accomplished. How do you help your students cope with winter weather? Let us know in the comments!